**sold** Pardini GT45 setup for bullseye with a frame-mounted Aimpoint, Rink grip, three different strength springs, & two magazines. $1950 + shipping & any FFL. The two stage trigger is extremely adjustable with hex wrenches- no mainspring voodoo to get the trigger to the weight & feel you prefer. Its easy to adjust the trigger to be crisp or a roll feeling. 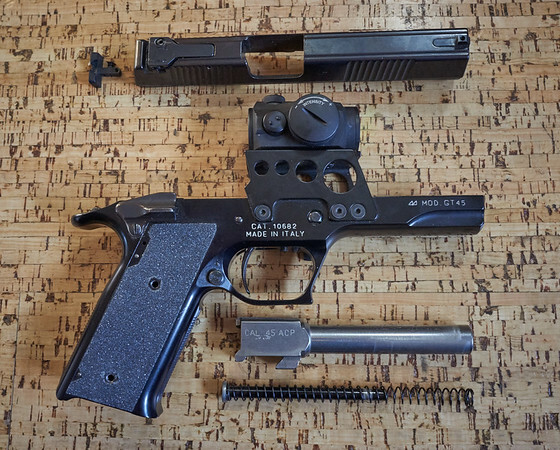 The gun has a Pardini "short" trigger relocation done for an easy reach around the double-stack magazine. This is a very simple gun and easy to clean and work on. The Aimpoint T-1 4MOA red dot is in great shape. The mount was milled and drilled so the Aimpoint is mounted directly to the frame for the most secure and lowest to bore line position. The rear iron sight is also included. The ejector is new and ejects the brass at about 1:30 or 2:00 with my loads, so brass catchers work fine. This gun is reliable with 200 grain LSWCs (I've used T&B bullets). My long line load was 4.0 WST. For short line the Pardini is reliable with much softer loads than a 1911- I used 2.9 of WST, but it is reliable as low as 2.6 grains. Most people seem to shoot the 185gn JHPs- the PO ran 4.8 grains of Bullseye, 1.2-1.205 oal, and a 0.469-0.470 crimp. The previous owner reported fewer than 2400 rounds and I've put fewer than 500 through it. The gun comes with the original wood slab stocks as well as a LRBO Rink grip. I also applied skateboard grip tape to both sides to provide the narrowest grip option and provide better grip for the wood stocks.The factory hard box is also included. 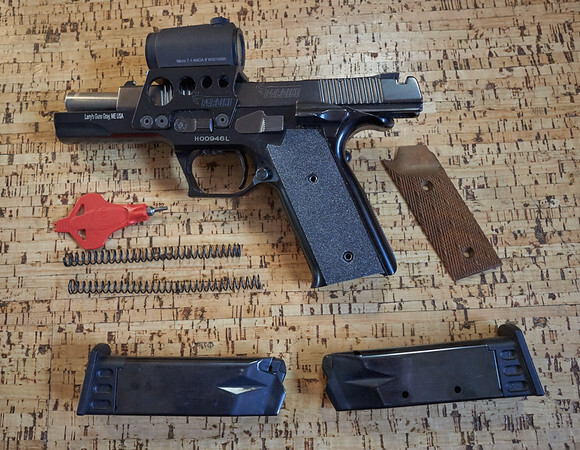 Is the "short trigger relocation" reversible? By that, I mean can the trigger be restored to it's original factory configuration? 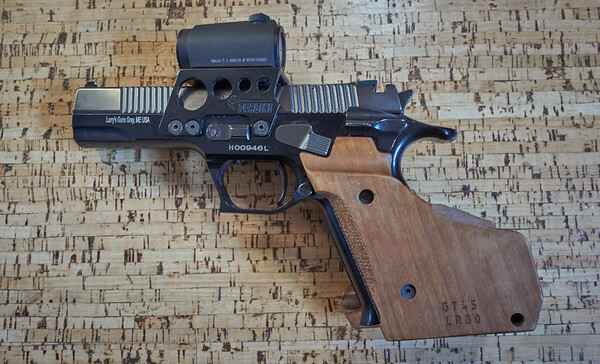 Yes, if he has the original trigger or you order a stock trigger from PardiniUSA. It is a drop in part, not too hard to change out. 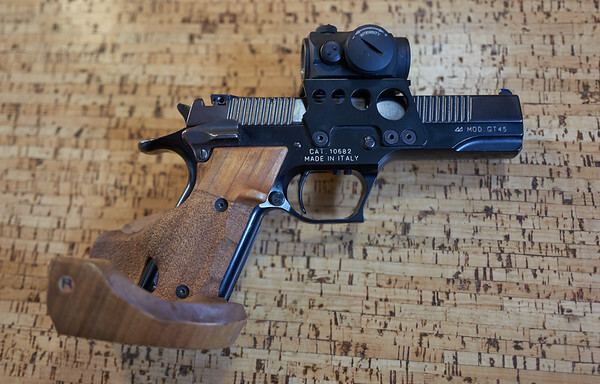 I changed out the stock trigger on TZ’s GT45 for a short trigger. I like it. It is a little thinner than the original as well. Not a huge difference, but enough to shift your finger position over from the pad to the crease. Like stepping from a long to short 1911 trigger.